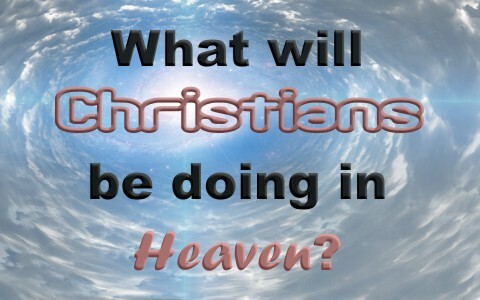 Have you ever thought about what you will be doing in heaven? The Bible tells us some of the things believers will do in heaven. The Bible teaches that there will be a new heaven and a new earth since someday the elements will all burn with fire as “by the same word the heavens and earth that now exist are stored up for fire, being kept until the day of judgment and destruction of the ungodly” (2nd Pet 3:7), and “Since all these things are thus to be dissolved, what sort of people ought you to be in lives of holiness and godliness, waiting for and hastening the coming of the day of God, because of which the heavens will be set on fire and dissolved, and the heavenly bodies will melt as they burn! But according to his promise we are waiting for new heavens and a new earth in which righteousness dwells” (2nd Pet 3:11-13). Peter briefly referred to “the heavenly bodies” melting “as they burn,” but just as believers have hoped for over the last 2,000 years, there is coming, “new heavens and a new earth in which righteousness dwells.” The Apostle John “saw a new heaven and a new earth, for the first heaven and the first earth had passed away, and the sea was no more. And I saw the holy city, new Jerusalem, coming down out of heaven from God, prepared as a bride adorned for her husband” (Rev 21:1-2). For one thing, I am ready for a new earth because this earth is groaning under the weight of sin, and like the children of God, we both await the redemption. The Apostle Paul says much the same thing, writing that “we know that the whole creation has been groaning together in the pains of childbirth until now. And not only the creation, but we ourselves, who have the firstfruits of the Spirit, groan inwardly as we wait eagerly for adoption as sons, the redemption of our bodies” (Rom 8:22-23). That makes two of us that groan…groaning for the corruptible to put on incorruption, and the groaning or eager expectation for the appearance of Jesus Christ. The image we see of people in heaven wearing wings or floating on clouds playing harps is so far removed from reality that it’s almost comical, but it’s also sad because we just don’t realize the glory that’s coming (Rom 8:18). Besides, there is nothing in the Bible about spending endless time floating around or above the earth or doing nothing more than playing harps and floating (or flying) around in the clouds. In fact, nothing could be further from the truth. When God establishes the kingdom of God on earth, shortly after the new heavens and the new earth arrive, it will be so amazing that it is hard to describe in earthly terms. For those that depart in this life, they are present with the Lord (2nd Cor 5:8), but Paradise is where Jesus promised the thief on the cross he would be on that very day and he’ll be present with the Lord (Luke 23:43), and Paradise is what the Jews considered being in the bosom of Abraham, much like the account of Lazarus and the rich man (Luke 16:19-31). Lazarus, the beggar, ends up in Abraham’s bosom while the rich man ends up in torment, so Paradise is generally understood to be where the Old Testament saints had gone, at least until the time Christ arrives. That’s why Abraham was already there, but paradise will be nothing like the Kingdom of God, but what will believers be doing in heaven, and for all time? Parables are stories that Jesus used by describing earthly things to introduce heavenly concepts. For example, in Jesus’ Parable of the Ten Minas, He shows that those who are faithful with what they’ve been given will rule with Christ, but of course under Christ. Jesus said to the one who was faithful with the ten minas, “Well done, good servant! Because you have been faithful in a very little, you shall have authority over ten cities” (Luke 19:17), but also “the second came, saying, ‘Lord, your mina has made five minas.’ And he said to him, ‘And you are to be over five cities” (Luke 19:18b-19), so as we can see, Jesus is speaking about ruler-ship for those who are more faithful than others. One man rules 10 cities while the other rules 5 cities, but there’s more. “To him who loves us [Jesus Christ] and has freed us from our sins by his blood and made us a kingdom, priests to his God and Father, to him be glory and dominion forever and ever. Amen.” (Rev 1:5b-6). Clearly, the children of God will be part of the kingdom of God’s leadership. Some will be kings, some will be priests, and others will be rulers, and it is a literal kingdom as Jesus promised the apostles that “you may eat and drink at my table in my kingdom and sit on thrones judging the twelve tribes of Israel” (Luke 22:30). This is not a metaphor but a reality of the coming kingdom of God. What position will you hold? It depends upon your faithfulness and what you do with what you’ve been given here on earth. We all have time, talent, and treasure, so if we sow these into the kingdom, we’ll reap greater rewards, but “For now we see in a mirror dimly, but then face to face. Now I know in part; then I shall know fully, even as I have been fully known” (1st Cor 13:12). I believe that means we’ll know those who have gone before us into the kingdom, and most certainly our loved ones who trusted in Christ, but we’ll also recognize the heroes of the faith, just as Peter, James, and John immediately recognized Moses and Elijah (Matt 17:1-13). Jesus didn’t introduce them or tell the disciples who they were. The disciples somehow knew, and that’s likely to happen to us. I think we’ll know others whom we’ve never met, just as we’ll be known by others. For all who trust in Christ, we will serve Christ in the kingdom (Rev 22:3), and we’ll certainly have company as “a great multitude, which no man could number, out of all nations and kindreds and people and tongues standing before the throne and before the Lamb, clothed in white robes, with palm branches in their” (Rev 7:9), and then, “the King shall say to those on His right hand, ‘Come, blessed of My Father, inherit the kingdom prepared for you from the foundation of the world’” (Matt 25:34). I don’t think we’ll care where we are at and who is holding more authority or less authority than we. We will forever rejoice, after hearing Jesus’ precious promise, “Well done, good and faithful servant. You have been faithful over a little; I will set you over much. Enter into the joy of your master” (Matt 25:21). And what joy that will be! Read more about Heaven here: What Does the Bible Say Heaven Will be Like? I don’t believe the question was answered. Hello Jen. Actually the question was answered. Why don’t you believe what the Bible says about being kings and priests and rulers in the kingdom? You don’t believe that? Then what do you think we will do in heaven? What would be your answer? Previous post: How Can Christians Avoid Sin?